Like in other parts of the world, also Indonesia has seen a rise in populism and narrow nationalism based largely upon religious and ethnic identity, which has proven attractive to voters. The politicization of religion is affecting inter-faith and inter-ethnic relationships, fostering intolerance, promoting a conservative moralist discours, and leading to the stigmatization and scapegoating of minority groups like Christians, Chinese and also LGBTs. Alissa Wahid, chairwoman of the GUSDURian Network Indonesia (GNI) will talk about this worrisome trends and possible responses on 18 February at SEA Junction. GNI hosts thousands of grassroots-level activists in more than 100 cities in Indonesia, working to promote interfaith dialogue and understanding, active citizenship, democracy and human rights, all values upheld by the late H. Abdurrahman Wahid – or Gus Dur, former President of Indonesia and leader of the Nahdlatul Ulama, the largest Moslem social-organization in Indonesia. Two events are being planned. 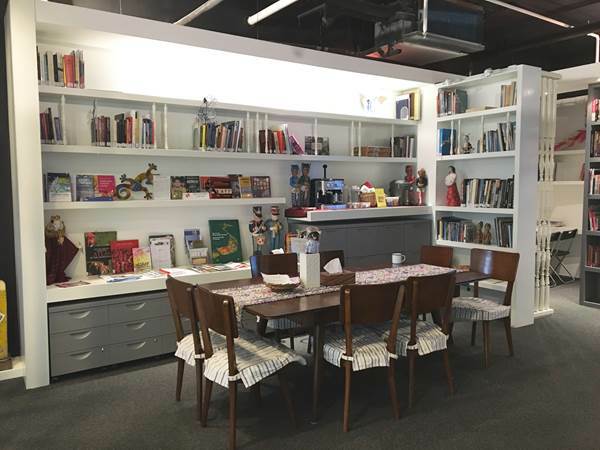 The first is an informal chat with Alissa Wahid for the Indonesian community in Thailand and other interested parties who speak Indonesian language in the morning of 18 February at 11AM. This will be followed at about 12.30 by a simple Indonesian meal also to celebrate the “Unmentionable: Rohingya Refugees in Cox Bazaar” photo exhibition closing on the same day. 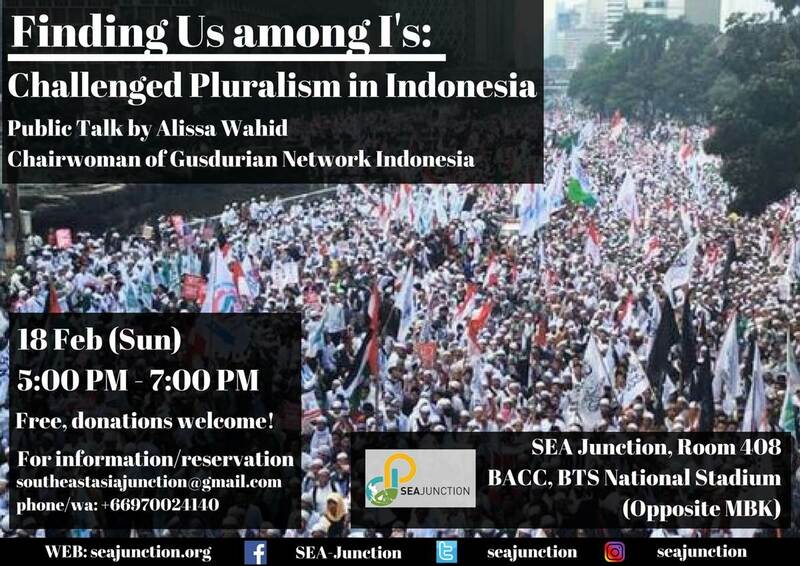 The second event on the same day at 5-6.30 PM is a public lecture by Alissa Wahid in English entitled “Finding Us Among I’s: Challenged Pluralism in Indonesia”. The lecture reflects on the threats posed by growing intolerance and religious populism to democracy and peace in Indonesia and ongoing efforts to safeguard the national spirit of “Unity in Diversity” in an increasingly fragmented country. Alissa Qotrunnada Munawaroh Wahid, publicly known in Indonesia as Alissa Wahid, is a trained family psychologist, but is most recognised for her work in the social sector on multiculturalism, democracy and human rights and moderate Muslim movements in Indonesia. She currently focuses on leadership development for interreligious youth leaders. She is the National Director of Gusdurian Network Indonesia (GNI), named after her late father, President Abdurrahman Wahid who is also known as Gus Dur. She is also active in Nahdlatul Ulama (NU) as General Secretary of its Family Welfare Agency. In this role, she aims to promote just, strong, and moderate Muslim families. Wahid meets with and speaks to thousands of people annually through public events. She is a Civil Society Ambassador for Sustainable Development Goals in Indonesia, focusing on Goal 16: Peace, Good Governance and Access to Justice. She received Indonesia Shine-On Award in 2015 from Good Housekeeping Indonesia magazine. She was also awarded the Women Award 2016 from Indonesia Marketing Week. NB: Events are free, but donations most welcome! The event is free, but donations are most welcome.